Titiwangsa Sentral is located in Kuala Lumpur, close to LRT and monorail station and it is about 15 minutes drive to KLCC. The project consists of two blocks 38-storey serviced apartment. There 8 units per floor and each standard unit has a built-up area of 1,100 sq.ft. Built-up Area : 1,100 sq.ft. Titiwangsa Sentral Unit for sale. Unit facing swimming pool and Titiwangsa Lake. Block A Highest Floor. Corner Block. Facing Titiwangsa Lake. Block B highest floor 1600sf. Block A highest floor 1100sf. 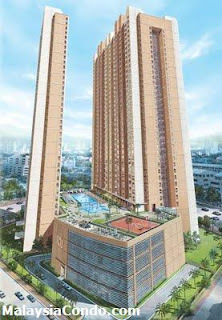 -Very strategic which located between LRT and monorail. Providing help in loan appication as having authorised banker which can offer RM520,000 during S&P. Still have few units left to sell, drop me an email if you are interested to purchase. >hi .i'm tony real estate property agent. > We have lots of inquires for sale and to let. > We welcome owners of Titiwangsa Sentral to list your units with us.